To provide young people with the opportunity to serve those in need, to learn what the Scriptures and our Tradition say about justice, and to hear the ways that God is calling them to convert the kingdom of niceness into the Kingdom of God. The programme Young Marist Neighbours began in 2007. It is a week-long service and learning experience for Year 12 students and, more recently, teachers, providing a solid, Catholic approach to service and justice that balances Scripture and Catholic Social Teaching, direct service, and the development of a justice consciousness. We employ the “See, Judge, Act” process of Pope Saint John XXIII, and provide the experience, skills and learning needed to make change possible. The students who participate in Young Marist Neighbours come from the nine schools in the National Network of Marist Schools, and are chosen by their individual schools. There are no specific criteria for selection, but most of the schools have their students apply for positions. Currently there are thirteen students on each programme, but there are constant requests from schools for more positions to be made available, such is the popularity of the programme. Each group is made up of one boy from each of the five all-boys’ schools, a boy and a girl from the three co-educational schools, and two girls from the one all-girls’ school. We find that five girls are more than a match for eight boys! We provide the Young Marist Neighbours programme six times each year, five times for students and once for teachers. The experience of the programme is very personal, and as such it is very difficult for the students to articulate on their return to home and school. We decided, therefore, to introduce a teachers’ programme, and now we have a growing number of teachers in the schools who have had the same experience and who can help the students to process what they have learned. At the beginning of Young Marist Neighbours, most of the students gather in Wellington, and then we travel by van and car, picking up others en route to Hato Paora College where we spend the first two nights. This is a time of preparation during which we introduce the basic principles of Catholic Social Teaching, but in the context of some very challenging group dynamics which both students and teachers find very confronting, and which push them well out of their comfort zones. This kind of impact learning is memorable, as it sets out to confront largely unchallenged conventional perceptions of life in our country and our world. We are at pains to remind the participants that nothing we say or do is personal, but radical examination of one’s attitudes and prejudices is usually very painful. Our ‘circle’ time, in which we process our experience and learning, provides the balance of support and encouragement that we are all on this journey together, and none of us has all the answers, or the perfect responses. Early on the third morning of the programme, we set out for whatever venue we are visiting. These venues include Kaingaroa Forest Village, Te Whaiti and Minginui, Ruatahuna, Ruatoria, Ranana, all across the central North Island. Our visits to Waitaruke and Pawarenga in the far North mean that we meet in Auckland and travel from there. 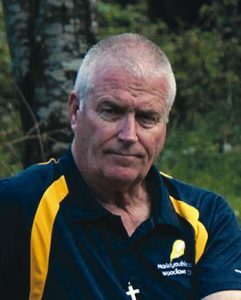 Fr David Gledhill sm has been instrumental in introducing us to most of these communities, and he continues to provide valuable support and instruction to our groups. We chose these communities because first and foremost they provide us with a cross-cultural experience. Most of them are materially poor, but our students soon find out that material poverty does not necessarily mean poverty of spirit. However, our students also experience, first hand, the dysfunction, and sometimes violence, that accompanies systemic poverty. They see the lack of opportunity for on-going education, the lack of jobs, the dependence on benefits, and all the social difficulties that these conditions foster. Almost without exception, the students and teachers are shocked that these conditions exist at our own back door. Our earliest intentions for Young Marist Neighbours were that we go to these places and offer some sort of material service by way of some project or other, but it soon became clear that what the people in the villages craved was someone from outside to spend quality time with their young people. We call it ‘the ministry of being,’ and most of our time in the villages is spent interacting in a variety of ways with the children and adolescents, sometimes at the school, sometimes at the likes of the local swimming hole, and sometimes on excursions around the local area. Even though we take different students from our schools every time, relationships with the local communities have gradually become very strong. Many of our students who have been on Young Marist Neighbours maintain the contacts they make by return visits to the villages, and by social media. There are enormous mutual benefits from Young Marist Neighbours. The people in the small and isolated communities value our visits, and the fact that we keep coming back. The visits are a highlight for their young people. Our own students come away changed. For most of them, their experience leads to a much more reflective approach to their own privilege, to their own use of money and resources, and to the difference between “want” and “need.” For a significant number of students, the Young Marist Neighbours experience has helped chart courses of tertiary study, and even, for some, the future direction of their lives. Through the generosity of our Network schools, we have been able to respond to requests from some communities to help children from the villages to attend boarding schools and further their secondary education with the intention of moving on to university. Many of the groups who have participated in Young Marist Neighbours have raised money to help the village schools purchase computers, sports equipment, art resources and the like. A network of Young Leaders has helped with the presentation of this programme from the beginning. They are university students and they volunteer their holiday time, placing huge value on the experience of leading our school students, as well as forming lasting realtionships with the village families. Some of these Young Leaders, now young professionals, have formed a charitable trust, called The Young Neighbours Trust, which is able to provide further scholarship help for children from the villages to attend secondary boarding schools. The Young Neighbours Trust is also supporting volunteers on a Mission Year experience, living at Te Whaiti and working with the school students at Te Whaiti, Minginui, Murupara and Kaingaroa Forest. 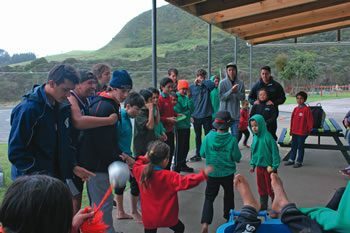 The final night of Young Marist Neighbours is spent back at Hato Paora College. The students reflect on their experience, write a summary of it in response to some questions, and then share their responses with the whole group. This process underlines the fact that the Young Marist Neighbours experience is firmly rooted in reflection and prayer. It has helped many students reignite the practice of their faith, and we have all experienced, time and again, the Holy Spirit speaking loudly and clearly through the people we have met and the events we have encountered.